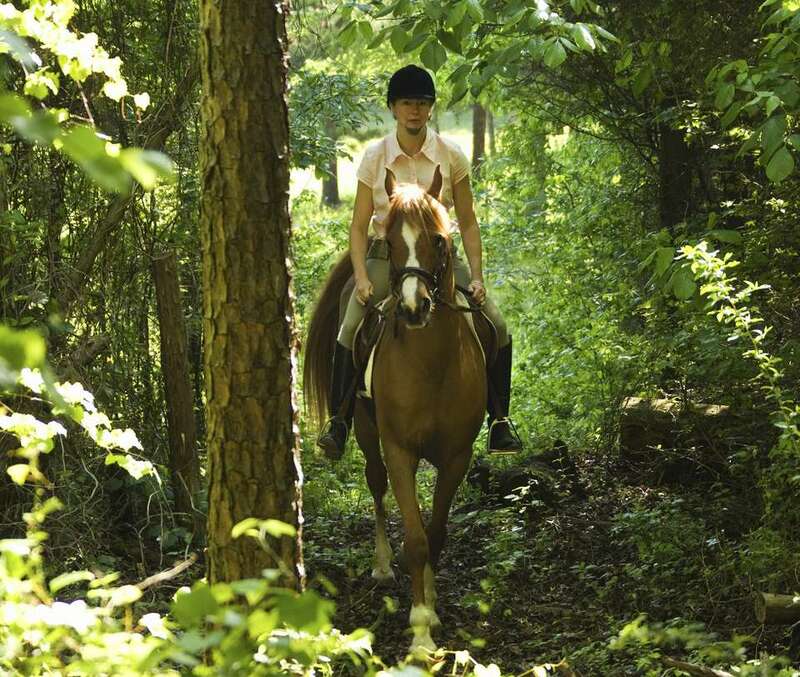 Competitive Trail Riding measures the fitness of a horse or pony as they travel over a marked trail of 20 to 120 miles. Horses are examined thoroughly before, on the trail and after finishing, by qualified judges and veterinarians. The events are strictly timed and penalties are given for finishing too early or too late. Horses are judged by how quickly their heart rates drop and other physical and metabolic measurements. The horses who show the highest level of physical fitness win. Most events have different divisions for junior riders and riders of different weights. There is often a division for novice horses and riders with more time or a shorter distance. The goal is to condition your horse to the highest level of fitness and take care of it so that the horse completes the ride with as little stress as possible. Prizes are awarded according to the fittest horses in each division. Almost any horse, except the heaviest draft breeds, are suitable for competitive trail riding. Horses with heavier muscles and ponies may not have pulse and respiration (called TPRs) recovery rates to win, but with good conditioning and care can finish successfully. Any saddle that is comfortable and fits both horse and rider. Comfortable clothes and approved helmet. Coolers and blankets according to the weather. Electrolytes--a sugar/salt solution to help your horse stay hydrated. When you arrive you'll visit the entry desk to get your rider's package. This will contain your number and scorecard and other information. You'll take your horse to the veterinarians who will give it a thorough examination noting pulse, respiration, hydration, soundness and any old injuries. All observations will be noted on your score sheet. You'll be asked to trot your horse on a loose lead as the vets watch for lameness or stiffness and overall attitude. You'll be assigned a time to leave and you'll saddle up and head out on the trail. Junior riders may be required to ride with an adult. On the trail, you will have to pace yourself so you do not finish early or late. You will want to help your horse stay cool by sponging him down and offering drinking water. In some events, you can have a support crew meet you along the trail and help care for you and the horse. You will stop along the trail at prescribed points and vets will again examine your horse. They'll check heart rate, soundness, and hydration. When you arrive at the finish vets check your horse again. After that, you'll be given time to cool your horse out, unsaddle and get him cleaned up before one last thorough check. When all the horses have completed, the score sheets will be compared and placings awarded according to the best scores. Exact rules and scoring vary depending on where you are competing. Many clubs have their rule books posted online. For your first ride, you'll want to start about 6 weeks before the event. Work up gradually to riding 5 to 7 miles about 5 days a week. Vary the terrain and footing. You should be working at a pace of 5 to 7 miles per hour in the weeks just before the event. Workouts in the ring while schooling count too. A horse that is being ridden steadily several times a week will be fit enough to do a 20 to 25-mile ride. Your horse will have several people checking him over. Get him used to being touched all over by strangers and especially to having his temperature taken. Learn to trot him on a loose lead rope. Since over-all manners and attitude count towards your score, you'll want your horse to be calm and obedient. Get your horse used to different tasting drinking water. It's very important that he drinks and eats throughout the day. By conditioning your horse you'll be conditioning yourself. The more fit you are the easier it is for your horse to carry you. Familiarize yourself with your horse's pulse and respiration rates. Take note of any old scratches or injuries so you can point them out to the judges. Anything not noticed at the beginning of the ride may be penalized at the end. Learn how to administer electrolytes. Before the ride, dress comfortably. Riding tights and t-shirts are acceptable. An approved helmet may be required. Use whatever equipment is comfortable and safe. Whether or not you decide to compete in a competitive trail ride again, you will learn an enormous amount about your horse and possibly yourself. You may win a ribbon, or be rewarded for your good horsemanship. But the mantra of most long distance riders is 'to finish is to win'.